The congregation of Estrella de Belén Luterana in La Resistencia, a barrio of Chinandega, Nicaragua gathered in celebration this past Sunday to celebrate an answer to prayer and a gift of land from God through St. Peter’s Lutheran Church in Leduc, Alberta. Two Sunday’s ago, the congregation had been worshipping in the local community centre (as they have for many years) when their worship was interrupted by a loud disturbance outside. Two of the community’s political organizations were disputing responsibility for the centre and the right to put their flags on the building. The dispute was getting out of hand and fearful that someone might get hurt or even killed, the worshipping community left the building. 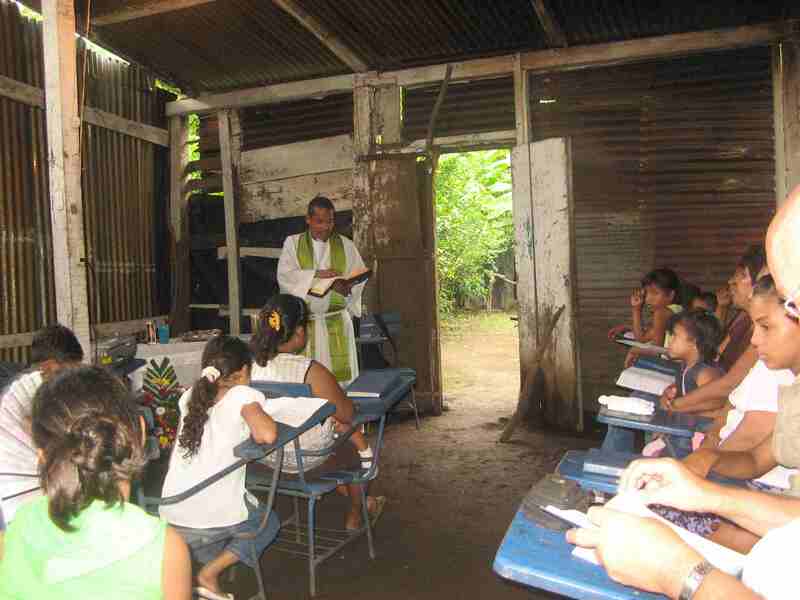 Since it was their desire not to be identified with either group or caught up in the dispute, Pastor Luis and the congregation decided that it would not be wise to continue to use the centre. But where would they worship and where could the children gather for their Christian Children’s Education Program during the week? They would have to meet in someone’s home and pray that God would provide in due time. And God did! Little did this small community of Estrella de Belén know that on the very Sunday this disturbance occurred a note would be sent from St. Peter’s in Leduc indicating their desire to take on a building project in La Resistencia which included the purchase of land for a church. Within two weeks land was purchased with a small house on it. Worship was conducted in that house yesterday and today the children will gather there for their Christian Education Program. St. Peter’s Lutheran will be sending a volunteer team to work with the congregation in building their church the latter part of March 2011. It’s Sunday night and I am at Trudeau Airport in Montreal, winging my way back home to Winnipeg after a weekend preaching tour of our LCC stations in Atlantic Canada. I flew Friday from Winnipeg (via Toronto and Montreal) to Charlottetown, capital of Prince Edward Island. Locals tell me it’s a shame it was overcast. I only caught sight of our tiniest province when the plane descended through the clouds on its final descent to the runway. Glad we weren’t late! I arrived about 5:15 p.m., and the first service was set to begin at 6:30 p.m.
Pastor David Milette of Moncton met me at the airport, and within minutes we were driving through this calm, picturesque little capital city to “All Souls Chapel,” the sacred site for our worship. All Souls stands beside the Anglican cathedral of Charlottetown (called St. Peter’s), and the host congregation has graciously offered this place for services free of charge. In recent years, a number of Lutheran people have moved to PEI, but there is no Lutheran congregation. Pastor Milette and the mission-minded church in Moncton have reached out with monthly services for a while now, aided in recent months by a seminary summer vicar who lived in Charlottetown. A handful of worshipers arrived for the service. Pastor Milette presided, while I preached and tried my hand at the chapel organ. Afterward we lingered and talked with those who attend, most of whom are not native “Islanders,” but have come from far-flung places like Calgary, Winnipeg, Nova Scotia—and, in one case, a woman who returned to her native PEI after decades in western Canada. Later we drove the “Confederation Bridge” and returned to Moncton, arriving just before 1 a.m. Pastor Milette’s wife, Doris (a former treasured church member of mine from St. Catharines, Ont. ), opened their home and a guest room, where I quickly drifted off to sleep. Moncton is called the “hub” of Atlantic Canada, and it became the hub of this weekend’s travels. On Saturday I drove with Pastors Milette and Paul Williams the three hours to Dartmouth, Nova Scotia. We stopped in Truro for wonderful seafood (at Murphy’s Fish-and-Chips downtown … try it when you’re in Truro). One of the proprietors seemed gladdened by having three pastors in the restaurant, and asked me to pray for her business as we left, which I gladly did. There is an extraordinary friendliness here among waiters in restaurants, I find. By 4 p.m. we were ready to begin the service at Faith in Dartmouth. Members assembled in the small house/chapel as I preached again. Afterwards, we had an indoor picnic downstairs in the fellowship room. This congregation may be an outpost, and may be small, but the people obviously treasure each other’s company. Members stayed for a long time, chatting and telling the stories of how they came to live in this area and find their way to our church here. A graduate student from Ontario, a Nova Scotia native trying to get re-adjusted after years in Saskatchewan, and others with fascinating stories of their pilgrimages in life and in the faith fill our time. It was already dark when we got into the car for the three-hour return drive back to Moncton. Sunday morning brought a service at Good Shepherd, Moncton, a place whose progress I’ve followed with interest since the 1980s, but which I had never visited. This was a big day for the congregation! In the morning I preached at the regular service, then enjoyed a wonderful fellowship dinner. Then, I took an after-lunch tour of Kingswood Academy, a day-care in a new building right next door to the church. Upstairs in the same new structure Concordia Academy is launching its first academic year as a Lutheran school. Kingswood is a stunning success and is already hoping to expand the building, since many young families are streaming into Moncton. The hope is it will prove a source of students for Concordia, and the Lord may provide many mission prospects through these ministry efforts. There’s much more to tell, and … I’m convinced … great prospects to expand the Lord’s work and ultimately to plant congregations in Atlantic Canada. As I rush off to my next airplane, I ask you to hold these preaching stations, their leaders and people, in your prayers. You are currently browsing the LCC On the Road blog archives for September, 2010.